Here is my completed Country Cottage Needlework - Ice Cream Sundae finish, it was such an easy stitch, I think I am going to be doing quite a few of these designs as I really enjoyed stitching this. Don't you think the colours are just yummy? I have posted quite a few pictures for you to get a good close up view and get a real feel for the design. Gosh, I could just eat some Ice Cream! and here in America, just scroll down the pages and you will find the pattern. It looks like my exchange to Yana has got lost in the post, I am sooooo disappointed. I am going to wait a couple more weeks to see if it finally arrives, if not I shall have to make another one, which is so annoying! I have started another exchange, but this one is for a lady in England, I do not think I will be as worried when I send that, but I will be using recorded delivery! Welcome to all of my new followers this week, I hope you enjoy your visits as much as I enjoy posting the photographs of my cross stitching. 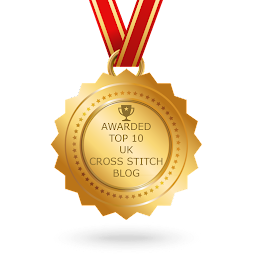 Have a happy stitchy week, thankyou for your visit! 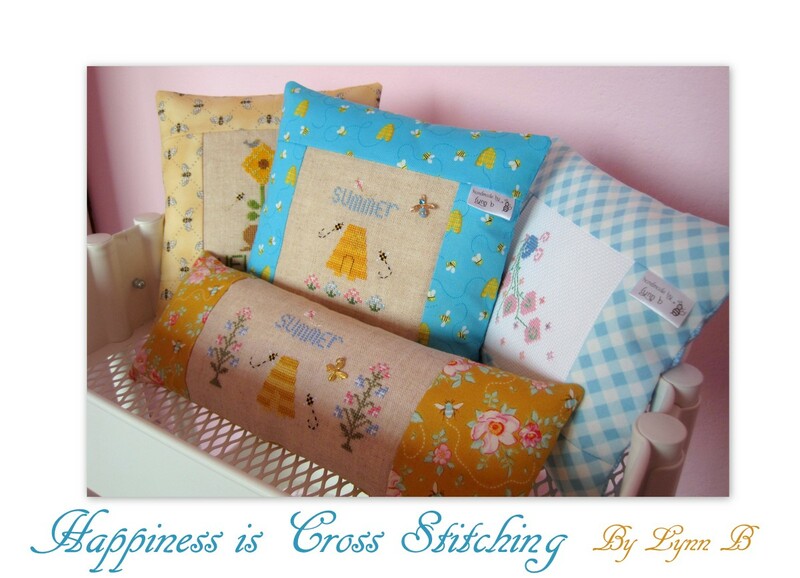 Hi everyone, I hope you are having a lovely stitchy week. 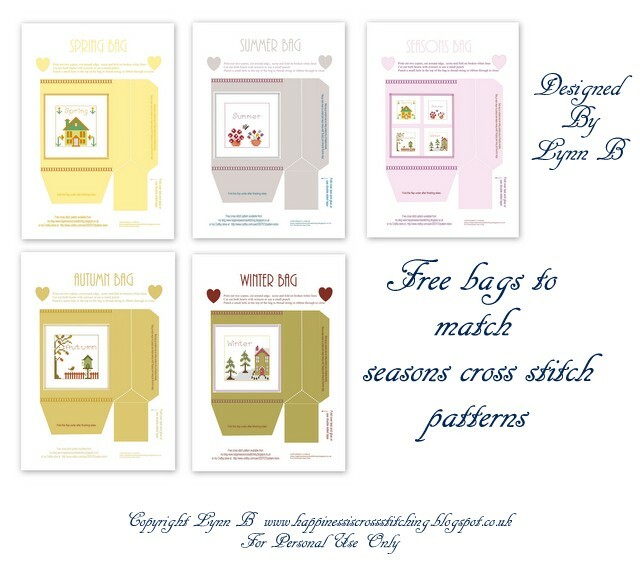 A few months ago I decided to treat myself to a stash of gorgeous fabric from Shabby Fabrics, if you have never seen their website go check it out here. They supply over the internet from America, they arrived only about 10 days later in England and they were worth waiting for, they are absolutely gorgeous, all of the colours blend together beautifully and every single one of the designs are really pretty. I have bought some other colours but I will save them for another time. Next up is the beautiful gift that I receved for my birthday from Angela, the gorgeous ribbons, a lovely Cypress bread roll and a notepad from the Victoria and Albert Museum, Angela knows I am into the Victorian era so this was perfect. I love taking tea in the garden so it will be lovely to wrap up some warm bread and eat it in the sunshine alongside a nice cup of english tea! Thankyou Angela for the lovely gift, I love it all. stitched 1 over 1 in red satin DMC thread. I love the flowers and the butterflies on this. Exchange from Yana and gift for a friend. Hello everyone, I have a number of pictures to show you, the first is the lovely exchange that Yana sent me from Russia. I received this a couple of weeks ago but I did not post a picture because I thought I could post pictures of the exchange I sent to Yana at the same time. 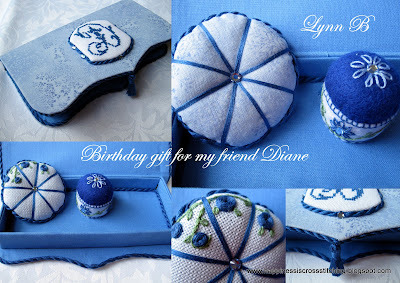 I have also made another blue box similar to the one I made for Gladys in a recent exchange, although this one has a slightly different design, it is a birthday gift for a friend. It is very similar to what I have stitched before, but my friend likes blue and I did not have any other blue fabric. Here is a close up of the gorgeous biscornu that Yana made, it is just beautiful! 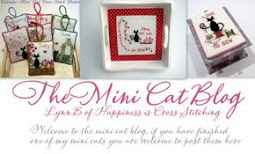 Including the beautiful needlebook and the scissor fob. I just love these little dolls that fit inside each other! Thankyou Yana for a lovely exchange, you are so talented! I hope you get your exchange soon. Happy Birthday Diane, I hope you have a good one! Welcome to all of my new followers, I really appreciate all of your visits and comments.